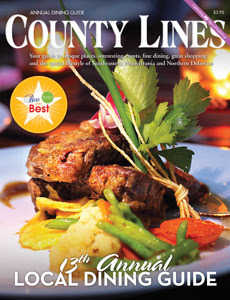 If I've been effectively doing my job, you're aware that throughout 2016, I had a contributing column to County Lines Magazine. It's a beautifully done monthly magazine that covers life in Chester County and the region from numerous angles. My angle, naturally, was beer which was rotated on a quarterly basis with wine and spirits in the non-beer months. My column is continuing in 2017 and here's a reminder for you to check it out in the January issue. This one is covering new beer establishments in the area beginning the oldest (it's all relative), Sterling Pig (Media, Pa.) and winding up with the newest, La Cabra (Berwyn, Pa.), covering Tuned Up (Spring City, Pa.), Brick & Brew (Media, Pa.), and The Bottle Room (Downingtown, Pa.) along the way. Please check out the column through this link and feel free to comment and/or share. I, and maybe even more so the editors, will notice and appreciate. Cheers!